Abby the Librarian: Don't Forget: 48 Hour Book Challenge is Coming! 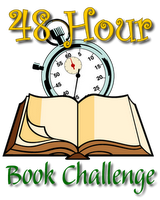 Have you been thinking about next weekend's 48 Hour Book Challenge?! I am really looking forward to one of my favorite bookish events of the year! I have already started putting my TBR pile together (and a TBR pile for The Boy), and even though I won't be able to devote quite the ENTIRE weekend to reading, I hope to read for at least 20 hours! Head over to MotherReader.com for more details about the challenge and to sign up in the comments.